I am from lanyard bracelets and friendship pins, from Pitfall and tins of Kraft mac-and-cheese. I am from doo wop on the record player, Johnny Mathis crooning while the tinsel twinkled on the Christmas tree. I am from the buzzing of cicadas during after-supper kickball games in the street, the lightning bugs at dusk while we hop fences playing Ring-a-levio. I am from Easter brunch golf cart rides and squishy locker room floors at the pool, from dad’s plaid pants in the Corvette going to Saturday soccer games, and mom’s curly lamb chops hidden in napkins under the lip of our plates. I am from thighs sticking to Nana’s vinyl car seats on the way to get Fribbles at Friendly’s on a hot summer day, from shag carpets and wood panelling while watching the Dark Crystal. I am from Sunday School hymns, dried palms and unopened Bibles. From stockinged feet in patent leather shoes in the backseat of a brown station wagon, eating Charleston Chews and sprinkled cookies while returning from church. I’m from Long Island beaches and heaping piles of pastrami. From tickets, golden rings and carousels at Nunley’s, and afternoon bike-riding adventures. I’m from boat shoes with curly laces at field hockey games on blue-skied, crisp, autumn days. From soccer balls and trophies and freshly shorn fields. I’m from sparklers and Barbies and sticker books and Keds. This was a writing meme that was inspired by other bloggers this past summer, and the original source can be found here. I was born in Baldwin at 11:30 at night on July 22. I was a fat baby. 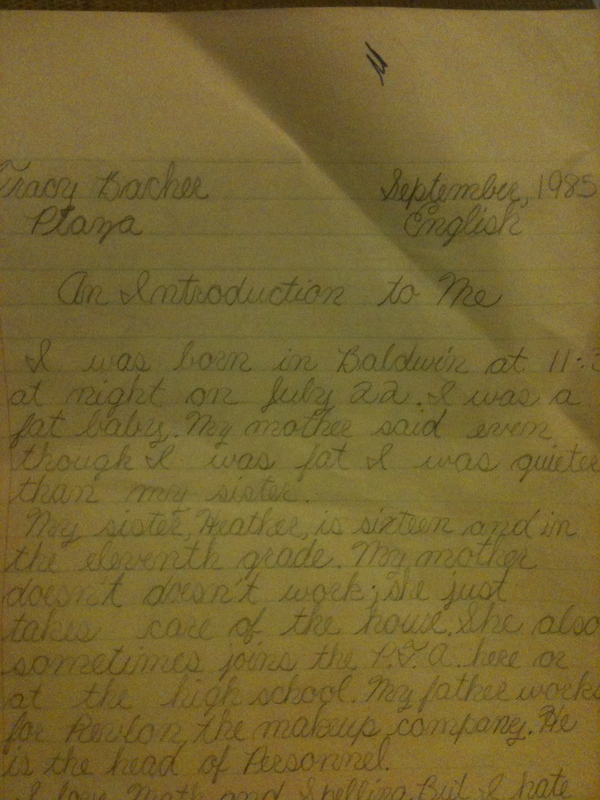 My mother said even though I was fat I was quieter than my sister. My sister, Heather, is sixteen and in the eleventh grade. My mother doesn’t work; she just takes care of the house. She also sometimes joins the P.T.A. here or at the high school. My father works for Revlon, the makeup company. He is the head of Personnel. I love Math and Spelling. But I hate everything else. Gym and Art are my favorite periods. I hate Music. ILC is not my favorite but I like it. Computer Lab isn’t so great, either. I love to play soccer. I am on the Baldwin Girls 75-76 travel team. My dad is the coach. We’re called the Baldwin Wildcats. I play center forward. Our first game is against the Wantagh Panthers. My hobby is collecting stickers. I had a perfect 1,000 stickers but I stuck them all over my notebooks. I love to watch T.V. When I watch it I can’t be taken away from it. My goal for this year is to be in the Spelling Bee. Last year we had a spelling contest. The last two people out were in it. I was close. I think I told you enough about me.